Much of 2007 wasn't kind to the financial-services industry. Buffeted by skyrocketing subprime mortgage losses, tightening credit and wrenching stock-market volatility, the industry-including banks, insurance companies and capital-markets companies, such as stock traders and hedge funds-saw tens of billions in asset value evaporate almost overnight. Kirk Herrington, president of GaleForce Solutions Inc., says that despite some recent economic thunderstorms, the overall forecast for the financial-services industry is a sunny one. Yet for GaleForce Solutions Inc., a Gold Certified Partner and provider of financial-services customer relationship management (CRM) solutions in Vancouver, British Columbia, Canada, it's been nothing but smooth sailing this year. Company President Kirk Herrington says that financial institutions are spending big and recent events have done little to slow them down. "Clearly, the market will be impacted by some of the subprime difficulties, but I've seen no effect from it," he says, referring to the recent sharp rise in foreclosures in the subprime mortgage-lending industry, which shook up the world's financial markets earlier this year. "The coffers in most of these institutions are pretty full right now." Tom Kneubuehl, of Gold Certified Partner Virtusa Corp., a consulting and outsourcing provider, is feeling similarly bullish. Kneubuehl, who heads the Westborough, Mass.-based company's financial-services practice, notes that his group's revenue is up 36 percent this year-and it's still climbing. "We don't see any signs of slowdown," he says. Nor do many others in Microsoft's channel. Despite the recent turmoil on Wall Street, these are flush times for integrators, solutions providers and ISVs that serve the financial-services industry. Partners report that financial institutions are making overdue investments in infrastructure and applications, putting IT companies with industry know-how in the money. Figures from research company IDC confirm that IT spending among financial institutions worldwide is up and expected to stay that way. Banks, for example, will boost tech budgets an average of 7.5 percent annually over the next five years, according to IDC predictions. "We've been looking at around 4 [percent] or 5 percent for most of this decade, so that's pretty good," notes Jeanne Capachin, a research vice president in IDC's financial insights unit. Same goes for the capital markets and insurance segments, where, she says, projected annual growth in IT outlays through 2012 stands at a robust 6.6 percent and 4.7 percent respectively. Still, don't expect cashing in on all that spending to be a breeze. Financial institutions can be demanding customers. "They need as close to flawless execution as possible because they're dealing with other people's money," Kneubuehl says. Expect clients to insist on airtight security and strict compliance with the industry's bewildering array of data privacy regulations. And be prepared to deliver nonstop availability as well, adds Mark Israel, principal architect at Charles River Systems Inc., a Certified Partner and maker of investment management software with headquarters in Burlington, Mass. But getting approval for your latest proposal will probably take a little longer. "They tend to be very conservative decision makers," Kneubuehl says of financial institutions. Herrington agrees, citing a recent deal with a bank that took GaleForce three years to close. Capital-markets companies, however, are often an exception to that industry rule. Hungry for the slightest competitive edge that new technology might provide, investment firms often green-light such initiatives in as little as three months, Herrington says. Of course, most financial institutions spend heavily on technologies that are anything but trendy. Security, for example, is a perpetual industry concern. "No one wants to have their firm on the front page of The Wall Street Journal or The New York Times [over] a security breach," says Charles River Systems' Israel. Similarly, he adds, demand is always brisk for disaster-recovery solutions. And thanks to regulations, that, for instance, require institutions to save e-mails and information in databases for up to six years, storage is a sizeable ongoing expense as well. Stay informed: Events in the news can have a huge impact on financial-services companies. Natural disasters mean big payouts for insurers-and possibly slimmer IT budgets as well. Conversely, a bull market can put capital-markets companies in a spending mood. Smart partners keep a close eye on the headlines. Influence the influencers: Tech buyers at financial institutions lean heavily on expert opinion. "They're much more inclined to rely on industry analysts and consultants than other industries," says Ellen Carney of Forrester Research Inc. So for ISVs in particular, sweet-talking the analyst community is likely to be time well spent. Play up rapid payback: Financial-services companies understand the importance of long-term thinking, but when it comes to technology they don't like waiting for results. "Coming up with quick wins can be really crucial," observes Gartner Inc. analyst Susan Cournoyer, who notes that showcasing even a few concrete short-term benefits when pitching a new solution can dramatically improve your odds of success. However, such hardy perennials aren't the only investment focus at financial-services companies these days. With mergers and acquisitions waning, many businesses view coaxing existing customers into buying additional products and services as a key growth strategy. That has them snapping up CRM solutions, which help with their cross-sales initiatives. Acquiring new customers is also an industry priority, driving banks in particular to spend strongly on Web initiatives. "The banking industry may open somewhere around 1,000 new branches a year, and you can only reach so many people with 1,000 branches," observes Kevin Downs, co-leader of the financial-services practice at West Monroe Partners LLC, a business and technology consultancy and Gold Certified Partner headquartered in Chicago. Online banking is a far more efficient way to reel in new customers, Downs says, so many banks are aggressively bolstering their online offerings with sophisticated new features. Insurance companies, on the other hand, are spending their online dollars on portal solutions to facilitate collaboration with brokers. "There's definitely competition for good [brokers], and having a portal to provide services and be effective about commissions can make a competitive difference," says Susan Cournoyer, a managing vice president and financial-services specialist with Gartner Inc. Also, she says, many insurers view strong Web offerings as essential for attracting increasingly scarce younger brokers. Business intelligence (BI) software is another popular line item on financial-services IT budgets. Most financial institutions have been warehousing customer data for years, IDC's Capachin notes. "Now they're having trouble managing that data and making it accessible to people," she says. The upshot: growing interest in systems that can help such institutions query and distribute their vast stores of reporting information. That should produce healthy demand for PerformancePoint Server, predicts Eric Blankenburg, CTO of Resolute Solutions Corp., a Bellevue, Wash.-based consulting firm and Gold Certified Partner that works extensively with banks and credit unions. He adds that the new Microsoft BI offering's low sticker price should make it especially appealing to smaller institutions that can use the technology "to compete in ways that just weren't economically feasible in the past." Communication and collaboration: Financial institutions are often sprawling organizations that produce masses of information. "Being able to find what you need and then collaborate around that information is a big, big issue, regardless of what size company you have," says Eric Blankenburg of Resolute Solutions Corp. That's why communication and collaboration solutions based on Microsoft Office SharePoint Server and Microsoft Office Communications Server are so popular, he says. Mobile-delivery channels: Consumers today want access to their money everywhere and all the time. That can translate to big business for partners that can develop, integrate and secure solutions that deliver financial services and information to customers' cell phones, PDAs and BlackBerries. Business-process automation: Eager to reduce costs and improve customer satisfaction, many financial-services companies are working to automate labor-intensive tasks such as processing insurance claims. "The lifecycle of a claim today can be weeks or months," says Susan Cournoyer, of Gartner Inc. "Potentially, with automation, you can drive that down to a few weeks or even days." Opportunities also abound for partners that can provide end-to-end services to regional and local financial institutions. With their bare-bones IT departments, such companies often find working with one or two technology generalists easier than managing relationships with multiple specialists. "[They] are definitely interested in having one vendor provide more of the solution," says Bill Lilegdon, vice president of the products group at Baker Hill Corp., a Carmel, Ind.-based Gold Certified Partner that makes financial industry relationship-management and process-flow solutions. Smaller institutions also tend to outsource technology functions more often than bigger businesses do, which creates opportunities for managed services providers. 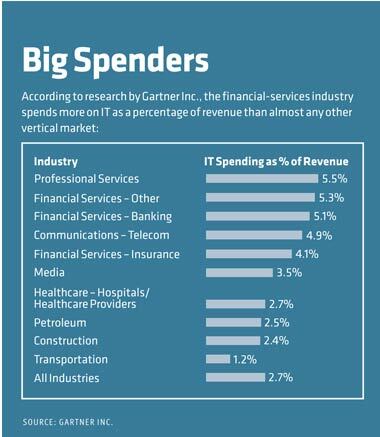 According to research by Gartner Inc., the financial-services industry spends more on IT as a percentage of revenue than almost any other vertical market. Having a solid list of reference deployments is vital as well. Most customers want proof that you've successfully completed similar projects for other institutions, says Nathan Ulery, who co-leads West Monroe Partners' technology and outsourcing solutions teams. "If you don't have that experience, they really won't answer the phone," he adds. Obviously, that pre-requisite can make financial services a tough market to penetrate, but companies that do successfully break in can expect to reap rewards for years. Says Ulery: "It's a pretty tight-knit community, and once you've done well, they will refer you to other customers." Indeed, many partners say that peer referrals play a large role in decision making at financial institutions. Creating customer user groups is one good way to capitalize on that dynamic, suggests Ellen Carney, a senior analyst and vertical marketing expert at Forrester Research Inc. Those groups provide venues for client executives to talk up a partner company's products and services to each other. Not surprisingly, user groups are just one of many tools that Microsoft uses to woo financial institutions. Eager to grab a share of the industry's copious IT spend, Microsoft has been steadily augmenting its financial-services sales and marketing resources. "We've grown from around five people eight or 10 years ago to maybe 500 now," says Tracy Issel, general manager of Microsoft's U.S. financial-services group. And no wonder: According to Issel, only the public-sector and manufacturing verticals produce more annual revenue for Microsoft than financial services do. Channel renewal solutions, which help banks connect their branches, ATMs, Web sites and other service channels. Insurance value-chain solutions, which streamline core processes such as sales, claims management and underwriting. Advisor platform solutions, which give financial advisers unified access to client information, research materials and other data from multiple-source systems. Enterprise risk and compliance solutions, which help businesses meet data privacy and other legal obligations. Yet many Microsoft financial-services partners say the company's industry strategy ultimately has little impact on their businesses. Nor is Microsoft much help in drumming up leads, adds Brad Levine, chairman of Blue Frog Solutions, a Pompano Beach, Fla.-based Gold Certified Partner that makes middleware and Web services solutions for the insurance industry. Blue Frog has a strong relationship with Microsoft, Levine says, but its monthly meetings with Microsoft's financial-services team rarely yield new opportunities. 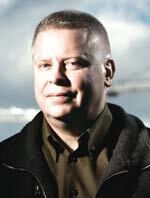 GaleForce's Herrington, however, says he gets five or six leads per week from Microsoft or other partners. He credits that influx of prospects to GaleForce's exclusive focus on financial-services clients. "We absolutely speak their language [and] understand their pains," he says. "Microsoft appreciates that." Issel confirms that vertical specialization is critical for attracting Microsoft's notice. "If your goal is to be actively engaged with my specialist teams, then you need to have financial services-specific offerings," she says. Better yet, link those offerings to one of Microsoft's four top solutions initiatives or target an underserved market. "I've seen small firms that focus on a niche area be really, really successful at getting our attention," she notes. Ultimately, the ball is in your court. Says Herrington, "It's up to us to deliver on how to do things better and faster and more efficiently."